Charlie and Cindy are best friend's. "can i share your umbrella Cindy?" 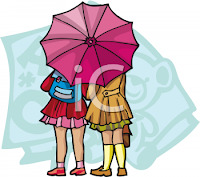 "yes you can share my umbrella"
"you two have to do more home work!" "But tomorrow i have R.E lesson!" "And i have to go to my grand mother's house!" "NO! do your homework till you get it all right!" SO both of them have to stay for their English lesson. I will try to put ,y own picture if i make one.